as we anticipate Convention 2012 - coming to Dallas, TX THIS JULY! 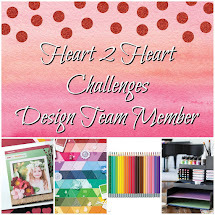 This is just a mini synopsis of the fun we have when thousands of Close To My Heart Consultants and our corporate staff gather together once a year to view our newest products, learn how to use them, and see beautiful artwork created with them while also gaining great insight into the business. You have to be a Consultant to attend and the memories are priceless. 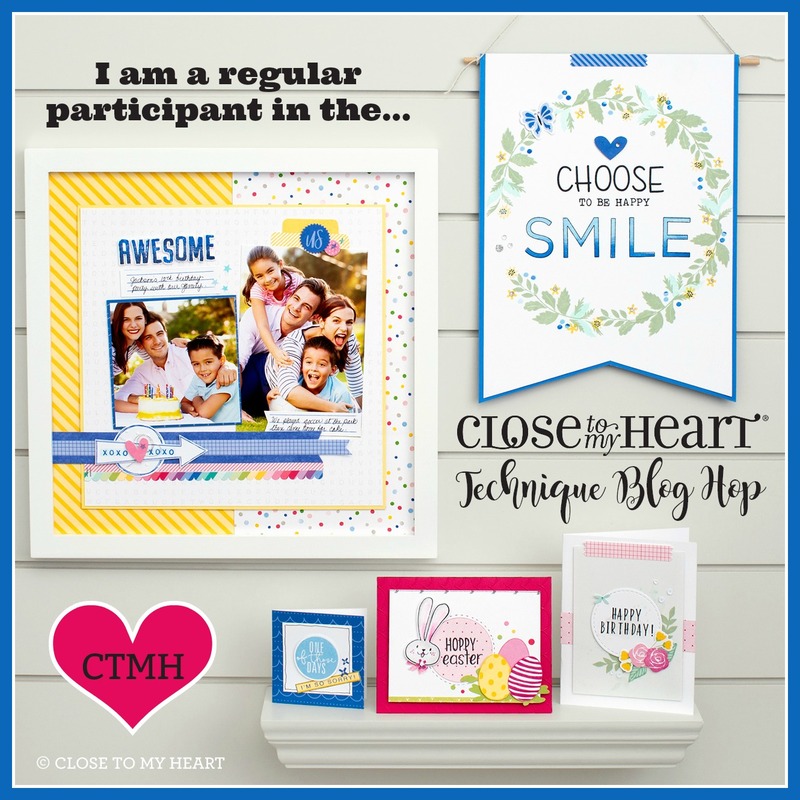 If you are interested in joining my team or are already on my team and sitting on the fence about attending - LOL, what are you waiting for?! Is this enough to convince you? The time is near when will party BIG in Texas! I hope to see you there! If you are reading this post and are registered for Convention...post so in the comment section. Let's see who we can look forward to seeing in Dallas! If you know me, I do not have a green thumb in me. Funny because my parents love to garden and I always have enjoyed their beautiful backyard. For some reason that trait was not passed onto me. I am thankful if I can keep a plant alive for a couple of months. LOL Luckily for me...no watering or maintenance is required in this garden. And better yet - there are no weeds! 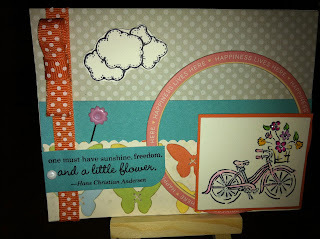 I am referring to this cute stamp set, A1119, called "A Garden". I have had my eye on it since its' debut in the current Idea Book, finally ordered it and now have played with it. Not sure what I was going to do with such small images (this is a standard-size card - 4 1/4 x 5 1/2), I decided on the Originals pattern, "Balance It Out", as a starting point. Using Cocoa CS as the primary background for this card, I cut the strips of B&T - out of the Dotty For You Duo Paper - leaving a small border around all four sides of each piece. (Have I mentioned I LOVE the reverse of the papers that have these cute polka dot patterns?! Where have they been all my life?!) 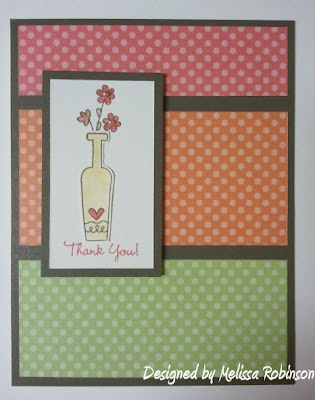 Then, I stamped the vase on a separate sheet of Colonial White CS cut it out and glued it on top of the floral image which was stamped directly onto the other piece of cardstock. 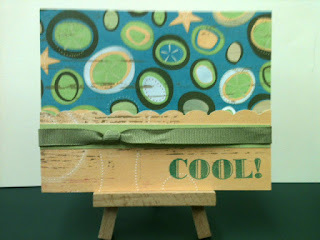 I used the Waterbrush pen to color in the images and used Smoothie ink - one of my favorite new colors - to stamp the sentiment. 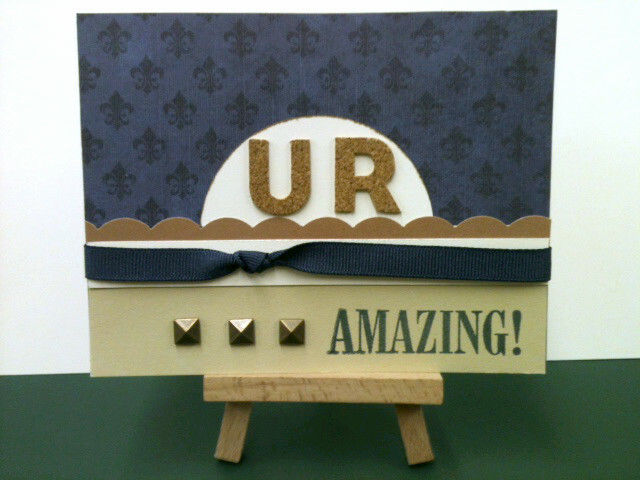 I love how simple, clean and attractive this card came out and pray that the recipient loves it just as much. Don't let this fabulous offer pass you by. 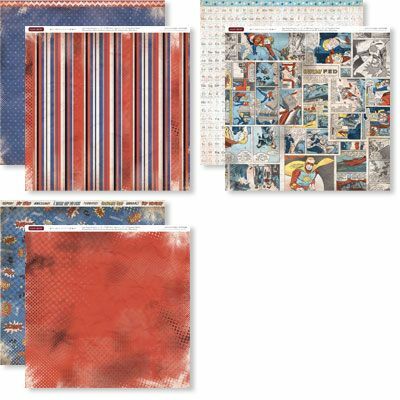 Off to make more items with this paper packet! Have a blessed weekend! 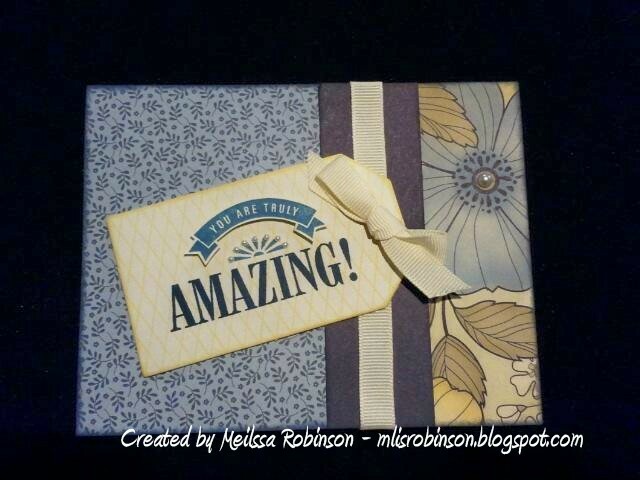 This is an oldie but goodie paper packet...Miracle. 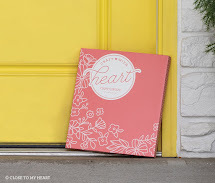 I love the colors of this packet and I thought it went good with pictures from our fun photo shoot at a youth retreat we attended in December. The green from the grass and blue skies really "worked". Funny because I have a photo from when Corey and I were dating years ago with him in a similar photo as the first one on the left. Too funny! I need to show that to him! Love the title of this layout and the photos which really highlight Corey's unique personality. He makes me smile! 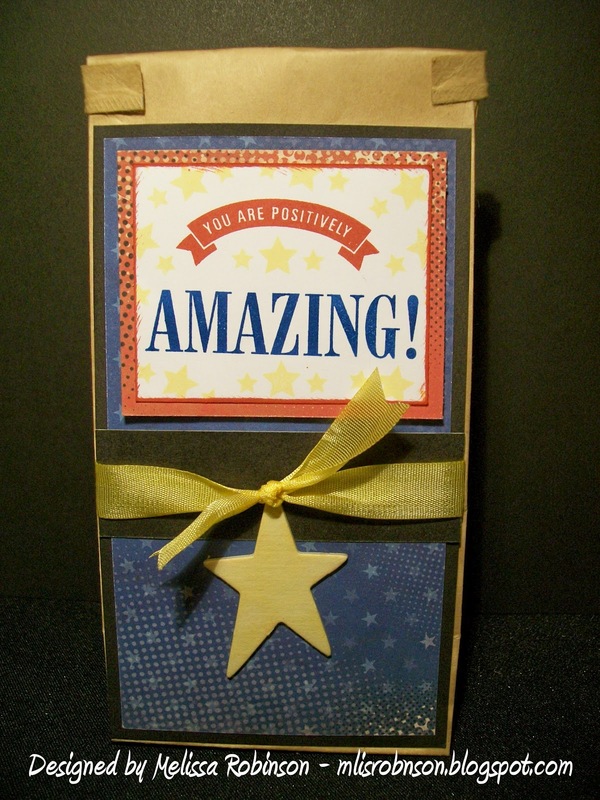 Using a little bit of a couple of things - Superhero paper packet and leftover Typeset Complements Canvas Shapes - I created this card for him. I love, love, love making "girly" things so when I need to make something more masculine it's a bit of "stepping out of the box" for me. 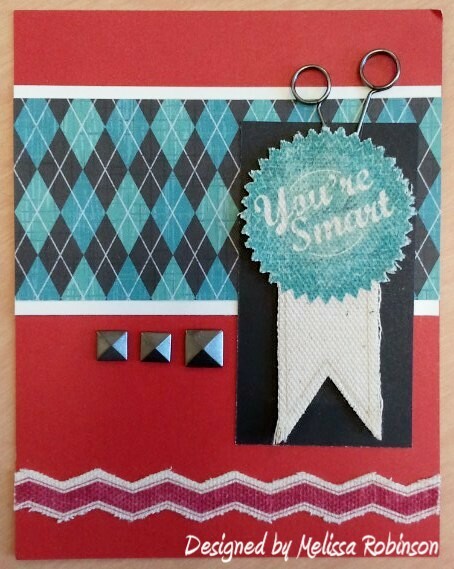 The "You're Smart" focal point is one of the Canvas Shapes as is the zig-zag image at the the bottom of the card. I decided to add a few pewter embellishments to decorate it up a bit. I used the Pin Clips and NEW Square Durable Studs (they are adhesive-backed and fun to play with)! 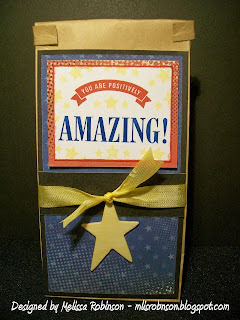 I know he will enjoy receiving a handmade card in recognition of his efforts! I have already shared that I am in love with the Dotty for You paper packet, available only through the end of May and in honor of National Scrapbook Month. 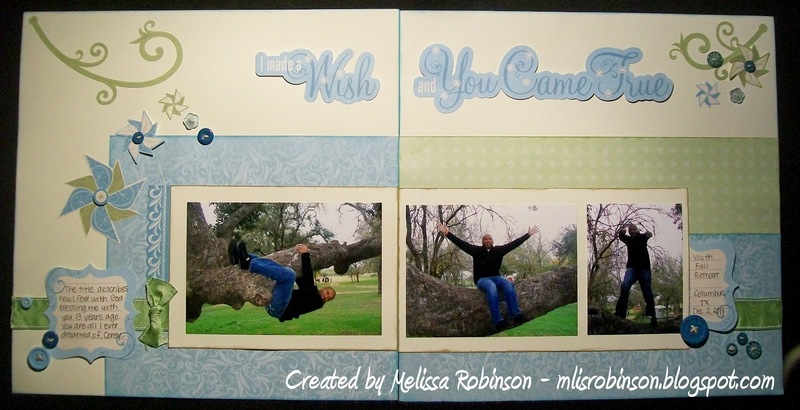 Since getting the paper packet, I have enjoyed creating items using it and one of the challenges issued by my friend, Sheila Wilkerson, was to create an item using this new paper packet while incorporating it into a current pack. 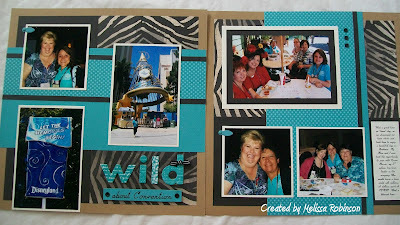 I chose to use the animal print B&T from the Roxie paper packet. 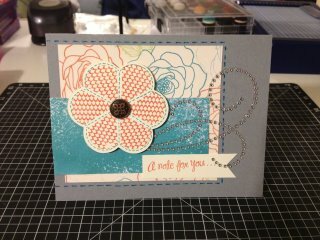 I incorporated the Lagoon polka dot pattern from the Dotty packet as well as some Lagoon, Black and Desert Sand cardstock. 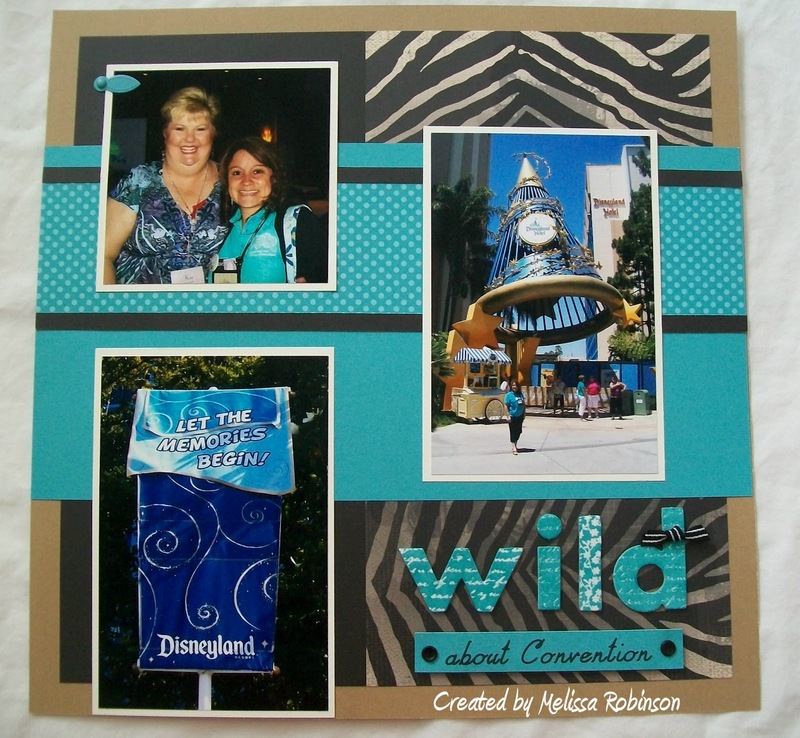 The "turquoisy" color in the pictures from Convention, the day we wore our team shirts, seemed to compliment this color choice perfectly and...I hope you agree! Last year's Convention was held in Anaheim, CA and I had a wonderful time sharing this event with my friends, team members, and Mom. We (my Mom and I) took advantage of an opportunity to take a photo with Karen Morris. She is both my 3rd upline and the leader of the top team in the company, the "Dream Team". The smiles on our faces show our enjoyment of our time together and I look forward to many more smiles and memories this summer in Dallas, TX! Because of the colors in this paper packet, I continued with the photos of our visit to Dallas Cowboy's stadium. It is a phenomenal facility if you have never been there before so the first time you have an opportunity to visit, you need to do so. Feel free to click on the photo to view an enlarged image. 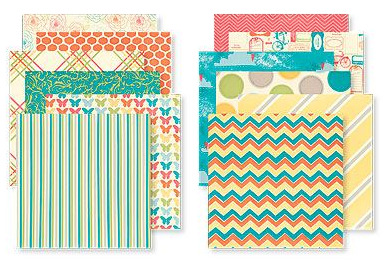 The new Pemberley paper packet didn't initially jump out at me like it did for most, although I did love the color combination. But just like I've experienced before - and I should have known better - as soon as I saw it in person, it moved to the top of my list for purchase. 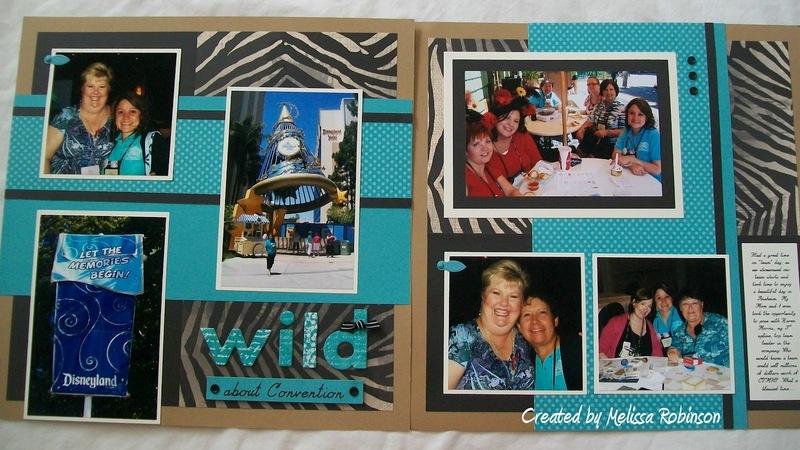 I had a fun time putting this layout together while highlighting my husband and our visit to Cowboy's Stadium late in 2011 for Faith & Family Day. We enjoyed touring the facilities and had fun posing for pictures in some of the player-only areas. 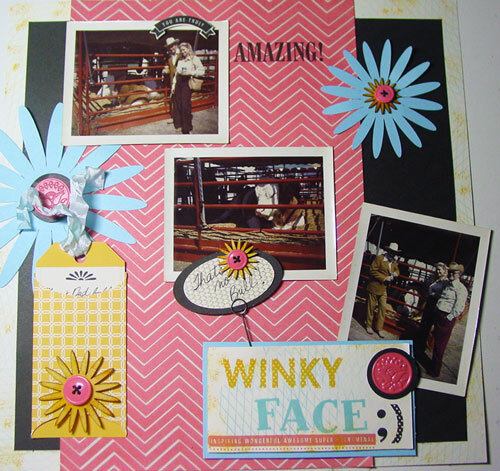 While the Stickease and B&T for this paper packet were deemed a little more "flowery", I think it was still fitting for the memory of this fun day and the title just helped set the stage. 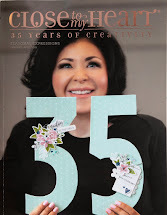 As promised, I am happy to share some BEAUTIFUL artwork creations designed by myself and several Consultant friends. 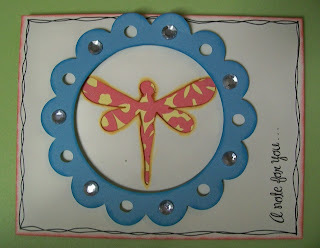 We only used the Dotty for You paper packet and coordinating cardstock, while incorporating various stamp sets, techniques, and embellishments to beautify our creations. One of the things I love, love, love about this paper packet is...THE BACK OF THE PAPERS! 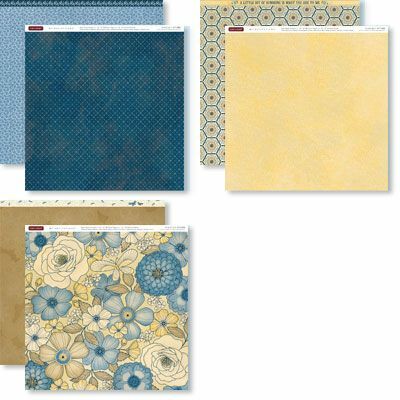 That's where the polka dot paper comes from and it comes in a variety of colors! Gotta love versatility! 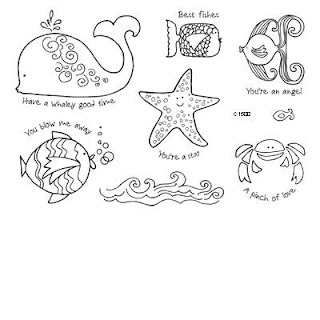 I decided to use the selected B&T after deciding to use the cute, new stamp set, "Under the Sea". 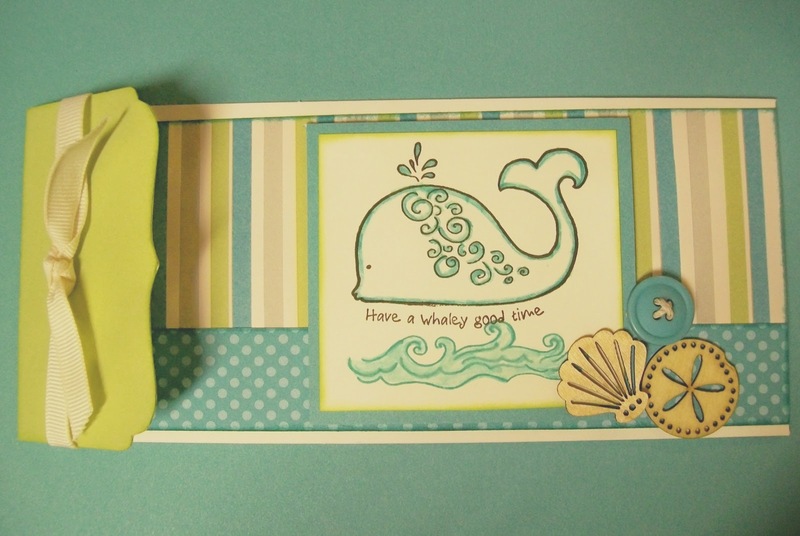 I figured I needed some blues and greens to really set the tone for the whale image I selected. 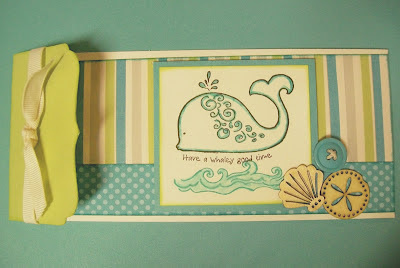 I also incorporated the Wooden Seaside Shapes, perfect for complimenting the theme of this card. I used the 3 1/2" x 8" Colonial White card bases for the foundation. 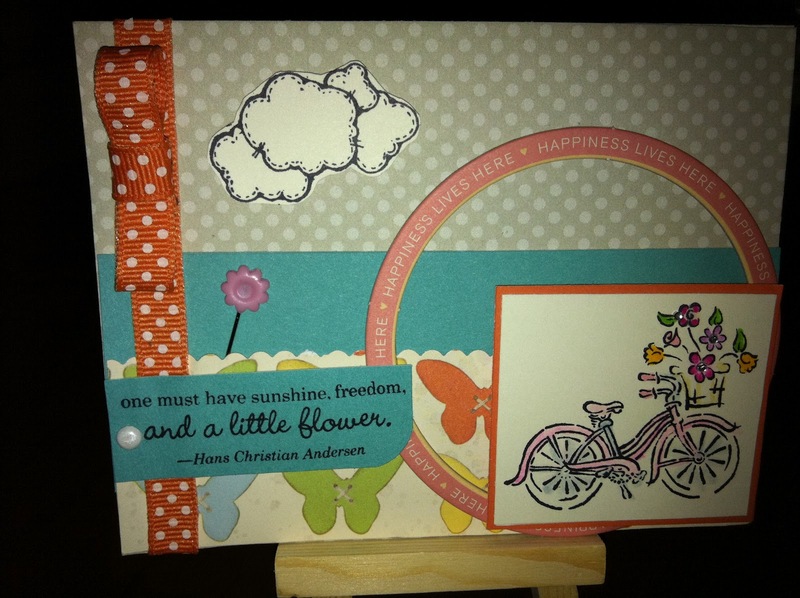 Overall, I was really pleased with the results and can't wait to make more creations with the beautiful, Dotty for You paper packet. 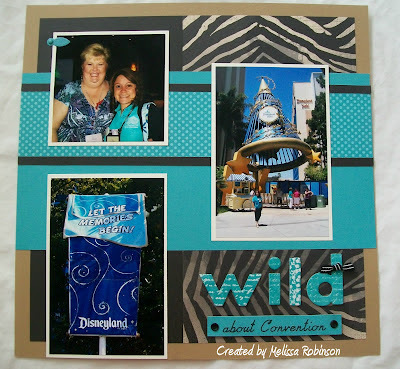 Please look below for more gorgeous artwork from fellow Consultant friends. May they provide inspiration for you. 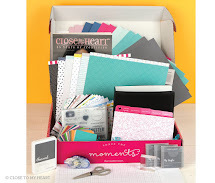 Watch the video below for a preview of the paper packet, beautiful items using it, and details on how it can be yours! 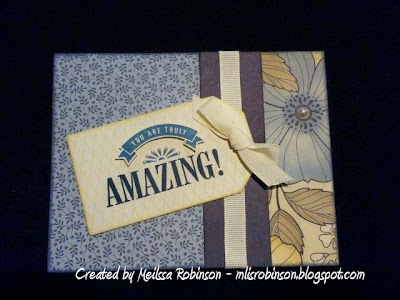 Check back tomorrow to see some beautiful handmade creations made using this beautiful paper packet, created by myself and some Consultant friends. You won't want to miss that post! 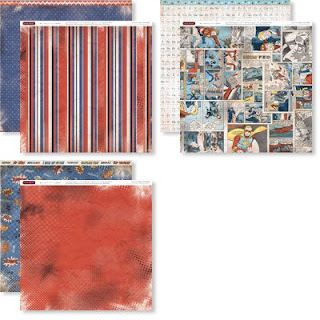 To order your paper packet, contact me today or feel free to place an order directly from my website. 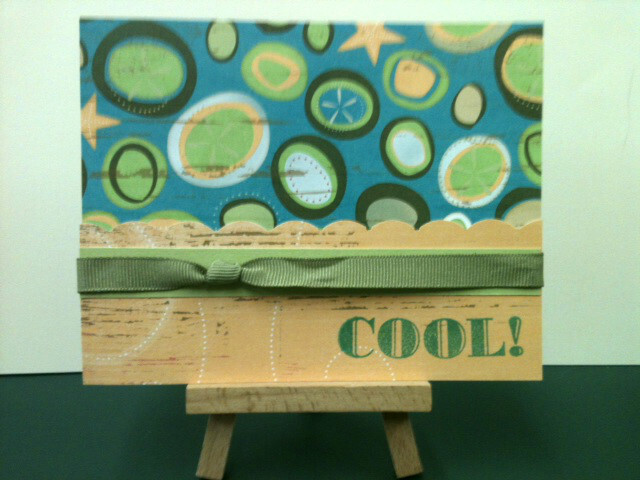 Thanks for joining us this month as we highlight the technique shown on page 33 of the Spring/Summer Idea Book. There are 15 of us participating in the swap. It is one big circle and you can find the beginning of the hop by clicking here. If you are coming from Judy Faye's Blog, you are on the right track. 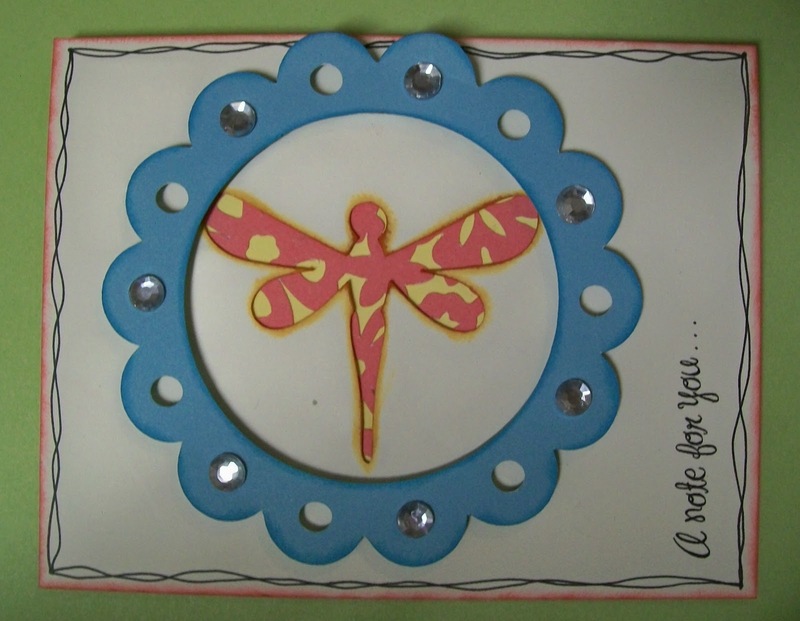 For this card, I chose to use the dragonfly image on the Cricut Art Philosophy cartridge. I also used a floral and "frame" image from the cartridge as well. 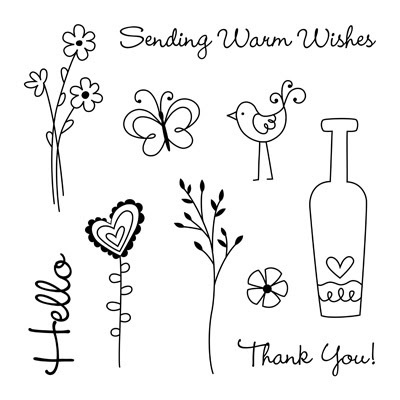 Now, hop on over to Shirley's blog to see what she has in store for you. I am going to enjoy playing with this month's stamp of the month. I ended up decorating this little bag I purchased from a friend (Hi Angie!) several month's ago. It's small in size - don't have the exact measurements with me - but perfect for some special treats. The bags are lined so even some baked goods would keep well in them. I used our new Superhero paper packet to decorate the front, incorporating Holiday, Moonstruck, and Buttercup inks to stamp. I also incorporate our AWESOME Color-Ready Seam Binding Ribbon and used it to create the Buttercup ribbon, to coordinate with the paper and ink. It is AWESOME in that it takes the color so easily (I applied it with a Sponge Dauber) and it dries very quickly. 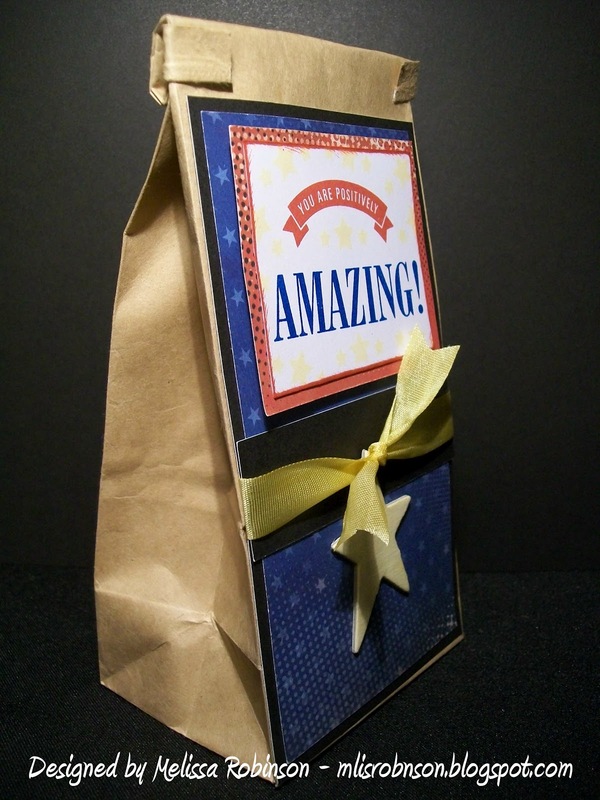 A little Star Dimensional Element, also inked in Buttercup, finished off the bag nicely. I know I have said it before but it amazes me how fast time flies. We are already into the fourth month of 2012! 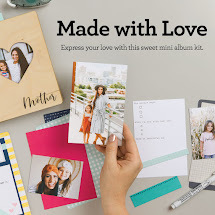 I love all that April brings - honoring the resurrection of Jesus, beautiful weather, a new newsletter (still in the sending process), a beautiful Close To My Heart campaign to start on April 17th and a fun stamp of the month. 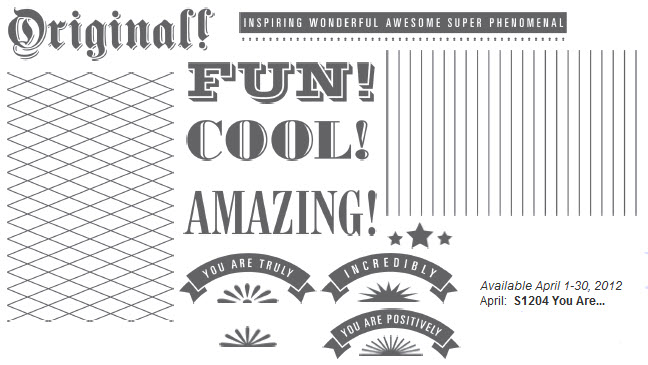 This month's stamp set is called "You Are" and has 15 different images to include bold statements and fun backgrounds! Below you will find some fun artwork items created with this stamp set. 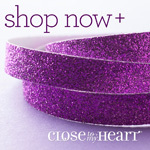 It is only available during this month and can be yours for just $5 with a $50 purchase! What a deal! Or you can purchase it outright for $17.95. Contact me (MlisRobinson@yahoo.com) or visit my website for complete details. 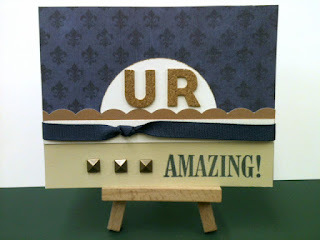 I made this card using the beautiful Pemberley paper packet (view below) and incorporated the Dimensional Elements that accompany our exclusive Cricut Cartridge. 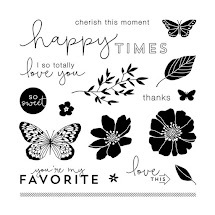 And find even more artwork with this stamp set on my website by clicking here.